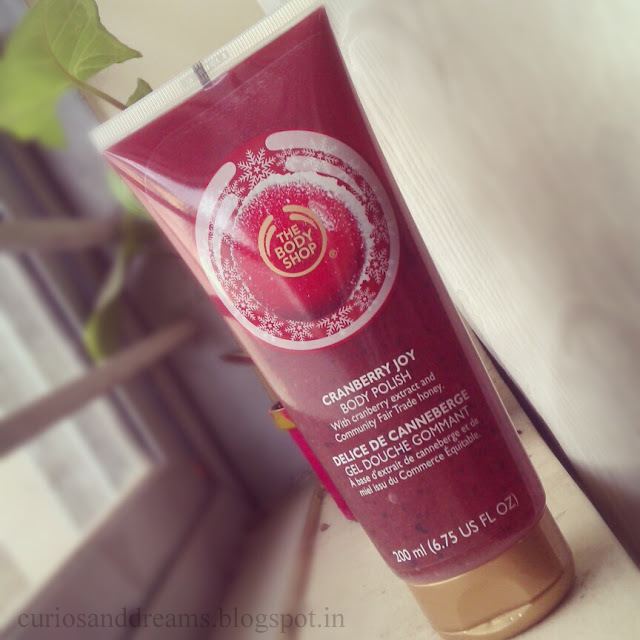 Cranberry Joy Body Polish: It's a limited-edition festive body exfoliator, gentle enough to use every day. It removes dead skin cells, leaving skin feeling softer and smoother, and has a delicious fruity cranberry fragrance. Ingredients: Water, Sodium Laureth Sulfate, Glycerine, Cocamidopropyl betadine, Acrylates polymer, Juglams regia shell powder (walnut), Fragrance, Benzyl alcohol, Phenoxyethanol, Sodium Chloride, Honey, Vaccinium macrocarpon seed (cranberry), Actinida chinensis seed (kiwi), Propylene glycol, Sodiun hydroxide, Benzophenone 3, Butyl methoxydibenzoylmethane, Disodium EDTA, linalool, Sorbitol, Vaccinium Macrocarpon Fruit Extract (cranberry), Denatonium benzoate, Red 33. This is my first body shop polish so I don't really have much comparison here. I just got so excited seeing it up for half the price that I had to buy it! The consistency is gel-like with cranberry seeds in it that help in exfolition along with the walnut granules and kiwi seeds.I used it both with my loofah and on its own. It lathers up really well with the loofah but the seeds sort of get stuck which takes some time for removal..fine by me. On its own it works well too. The granules aren't harsh and exfoliate well. On days when I want some heavy duty scrubbing, I use it with the exfoliator gloves also bought from The Body Shop. The body polish comes in a transparent squeezy tube with a flip cap. Easy to use and leak proof. The packaging looks very Christmas-y! Hey Sukanya! I have just entered Nature's Co. a couple of times but i just got confused with all the products. Will check their gels now. Thanks! We just love The Body Shop products and their exfoliators are amazing! Thanks so much for finding our blog and following us. We are following you via GFC! Yes @ Jayme and Mendi... the body shop has some drool worthy products.